Great camera at great value. It's not going to compare that well to a DSLR but compared to other cameras in it's class, it's an excellent little camera that I carry around with me all of the time. What I like about it is that it takes sharp clear photos (with my Kodak 433, I used to have to "sharpen" all of my photos) while with the Fuji, I find the photos look a lot better right off the card. Granted its not the most expensive feature packed camera, picture quality not always that great. about 1 in 4 pictures is waste due to image problems, low light, blur etc. You MUST buy extra memory. the internal memory will hold 2-3 pictures at the 8 MP setting. Oh, did I mention the LCD screen is cracked? with minimal use, non abusive carried in my pocket the screen is unusable with no other view finder, its unusable. looking into warranty repair, but I'm guessing it will cost more than the camera. The camera is wonderful! It came out exactly as it looks on the website. I ordered it for my 11 year old daughter as a Christmas present and she loves it. She finds it very easy to use. My problem is with the shipping. I ordered it as a Christmas present after reading all the wonderful reviews regarding their shipping. It took the FULL 10 days to arrive at my house. It did not make it in time for Christmas. Then when it did arrive, the box was soaking wet all the way through!!! It seemed as though someone dropped it in the ocean and then delievered it to my door. Everything in the box was soaked! Luckily the important things were wrapped in plastic bags. 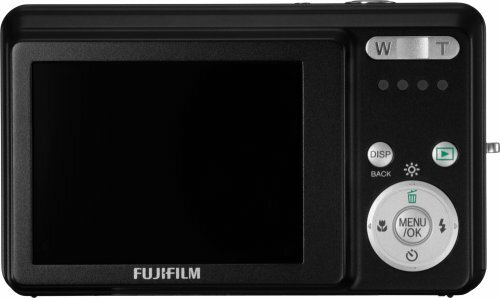 Fuji film 8mp J-10 camera. I had trouble choosing this camera over a samsung 860. But I got a J-10 for a good price. Along with that , I already had some XD cards from my not working so good fuji A350. So at least I didn't need to buy SD cards. This zoom is alittle jittery over the samsung 860, but not by much. So I try not to use zoom if I can help it. I purchased this camera for a recent vacation and found it to be an excellent choice. The Finepix is an easy to use point and shoot camera. The pictures it takes are very clear - this is probably a result of Fujifilm's Picture Stabilization Technology. I took pictures from a moving bus, and they look as if I'm standing still. The camera is good in low light at a reasonable distance. We took pictures of the Las Vegas Strip at night, and they look amazing. However, we also took pictures in a very dim room and found that unless the object you were focusing on was close at hand, it was very difficult to see in the picture. The low light pictures still very clear. The 3X zoom was perfect for every picture that I wanted to take and made items look close enough for a good shot. I read the features. I even enjoyed the camera while I had it. It failed within the first month. The lens would not extend. The good easily outweighs the bad. Great walkingaround cam. A lot is wrong with this camera except the image quality which is wonderful. There is about half as much noise at the same ISO as my Canon point and shoots which is amazing. I wonder if Fuji can't say how good it is because it might be better than their upmarket cameras that are supposed to be low noise. Adequate for some sunsets, that's one of the major reasons I love it. The lens might not have much telephoto but that made it easy to manufacture a very good lens. Variable shutter to 8 seconds in fireworks mode. Usable night mode with a tripod. ISO 64 to 1600 in "manual". I bought two as my observation is that when a camera this good comes along it is quickly superseded with something worse. This also gave me a spare battery. To return to shoot mode press the shutter. This is really the best way to do it but they could have programmed both ways instead of the stupid message. The software didn't do much except stop my card reader from working (Win 2K). At least it uninstalled neatly and now I use the reader. The menus are in seemingly random order but include useful functions. The corners are cut off at full wide. Big deal, with 8 megapixels there is plenty to crop out. Typical for little cameras. The battery seems to run down over a few weeks if left in the camera. Best not to store the camera with the battery installed and carry a spare. Fantastic Camera for the price!